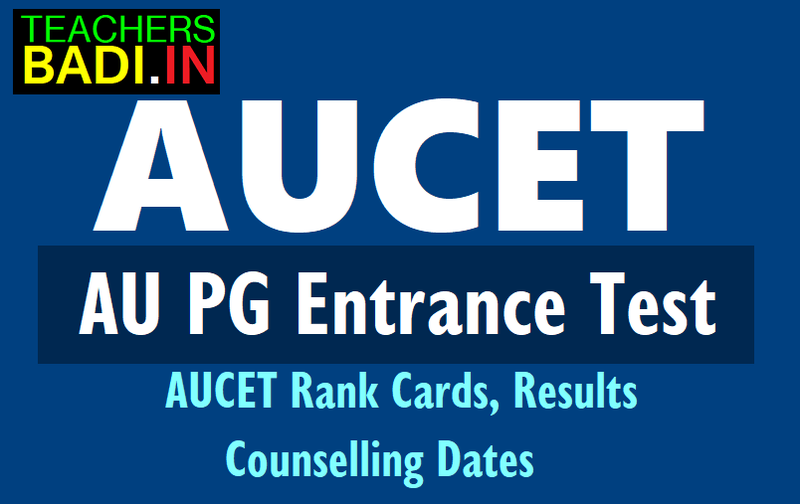 AUCET 2019 rank cards, AUPGCET results 2019 and counselling dates: Andhra University has published Post Graduate Common Entrance Test(PGCET) 2019 Notification in the month of March, 2019 and AU invites online applications from the candidates who have passed or appearing for the final year examination in the qualifying degree for admission into Post Graduate courses as listed in its website (www.AU.ac.in) leading to Post-Graduate degree in M.Sc., MA., M.S.W., M.Com., M.H.R.M., M.Ed., M.P.Ed., PGDAS., P.O. Diploma in Yoga., 5 Years Integrated Courses in M.B.A. and Nanotechnology for the Academic Year 2019-2020 offered by Andhra University Campus. PG Centre, Vizag and its Affiliated Colleges through AUCET-2019. Submission of online application: 15.03.2019 onwards. Last date for submission(without late fee): 15.04.2019. Last date for submission(with late fee Rs.1000): 25.04.2019. The candidates, who were appeared for the pg entrance exam, they can download the rank cards from the official website. Hall Ticket and Rank Cards are should be retained by the Candidate even after the Entrance Test as it is required at the time of Counseling. Candidates can download their Rank Cards and Schedule of Counseling from the website www.audoa.in. The movement the above material is uploaded to the website, it will be informed to the candidates through SMS / E-mail. Counselling dates would be announced the after release of rank cards. Andhra University on Sunday declared the results of AUCET for admission into various PG courses offered by the university and that of AUEET for admission into the 6-year dual-degree (B. Tech plus M. Tech) programme. Andhra University, which conducted AUCET-2019 for providing admission into various PG courses and AUEET-2019 for admission into the integrated engineering courses in Andhra University and B R Ambedkar University, Srikakulam, on May ......, released the results here on Friday. After releasing the results, Vice-Chancellor Prof G Nageswara Rao said that special counseling for NCC, CAP, physically challenged, sports and NSS areas will be held from May ................ at the office of the Director of Admissions. He said that screening of certificates will be held in Visakhapatnam, Srikakulam, Kakinada and Vijayawada centres from June 1 while the counselling and allotment of seats will be done online. Registrar Prof V Umamaheswara Rao, Director of Admissions Prof K Rajendra Prasad, Media Relations Dean Prof P Bobby Vardhan, Assistant Director Prof Vazir Mohammad, C V Naidu, P D Satyapal, principals and deans were also present. A total of 1,272 seats in 47 different courses will be filled-in in Andhra University Campus Science College, 1,420 seats in 35 courses in Arts College, 360 seats in eight courses in the integrated engineering courses and 60 seats in the two Mahila Engineering Colleges through counselling. For admissions in the integrated engineering courses, AUEET rank holders will be given preference and the balance of seats if any will be filled up with the IIT, JEE and EAMCET rank holders in the second counselling. At BR Ambedkar University, Srikakulam, 172 seats are available in six Science courses and 320 seats in Arts courses. While attending the counselling, the candidates should bring marks list, TC, study certificate, caste certificate, degree provisional certificate and income certificate and even those who write instant exams, would also be given admissions. The details of counselling for integrated engineering courses and vacancies will be uploaded on the website soon. Andhra University, Vishakhapatnam, has declared the results for the Andhra University Common Entrance Test (AUCET) 2019. Candidates who have appeared for these exams and wish to check their results can do so from the official website. This year, Saripalli Hari Priya bagged the top position in Life Sciences, Kalisetti Vasu Babu topped in Physical Sciences, Pilla Ravethi secured the first rank in Mathematical Sciences, Bikkina Dileep Ramam Raju topped in Chemical Sciences, Prattipati Vidyasagar in Geology, Sesibhushana Rao Hanumanthu in Humanities and Social Sciences, Joga Priyanka in English and Yamalapalli Sai Prakash in Telugu. AUCET 2019 was conducted on May 8 and 9 and those who have cleared the paper are eligible for admission in Andhra University and Dr B R Ambedkar University, Srikakulam in any of the 33 courses in the science stream, 47 courses in the arts, 6 integrated engineering courses and one in law. The Directorate of Admissions at Andhra University has received 22,948 applications this year and the exam was conducted at centres in Visakhapatnam, Srikakulam, Rajahmundry, Eluru, Vizianagaram, Kakinada, Vijayawada and Guntur. Verification: According to Director of Admission O. Aniel Kumar, the verification and allotment of seats for the special category will be held from May 28 to 30, at the director’s office and for others it will be held from June 1 at four centres in Visakhapatnam, Kakinada, Srikakulam and Vijayawada. While the centre at Visakhapatnam is yet to be decided, it will be held at Gayatri College in Srikakulam, Ideal College in Kakinada and SRR and CVR Government Degree College in Vijayawada. Steps 1: Go to the official website of Andhra University (andhrauniversity.edu.in). Steps 2: Follow the link to the Directorate of Admissions. Steps 3: Click on the notification for “AUCET-2019 :: Test Result”. Steps 4: Scroll through the PDF provided and look for your roll number. Use ctrl + F to make your search easier. Steps 5: Download your results and take a print out of the same for further reference. my friend has got all india rank 2254th in national institute of fashion technology(N.I.F.T ) and category wise 34th rank in S.T quota.His parents can't afford the money required for each year (total 4 yrs).so,i want to know any schemes are their to help him. how much fee is re-embassed for m.yech students whem got seat through councelling?